GFR word stands for Glomerular Filtration Rate and tells how well your kidneys are working? Most people who developed CKD they weren’t know at earlier time because the disease itself progress silently for long period of time. Usually a man comes to the ER room complains from signs such as swelling, high blood pressure, nausea, poor appetite, and vomiting. After doing General Medical Checkup at the laboratory, results come with high creatinine level which indicate chronic disease of the kidney. The GFR results seen in healthy individuals with normal kidney function. 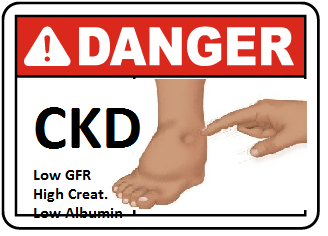 Remember: GFR declines with age, even in people without kidney disease. How to tell which Chronic Kidney Disease stage you are in by GFR levels? What Do GFR Blood Test Results mean? It means the percentage of normal kidney function which is an estimate of remaining kidney function. 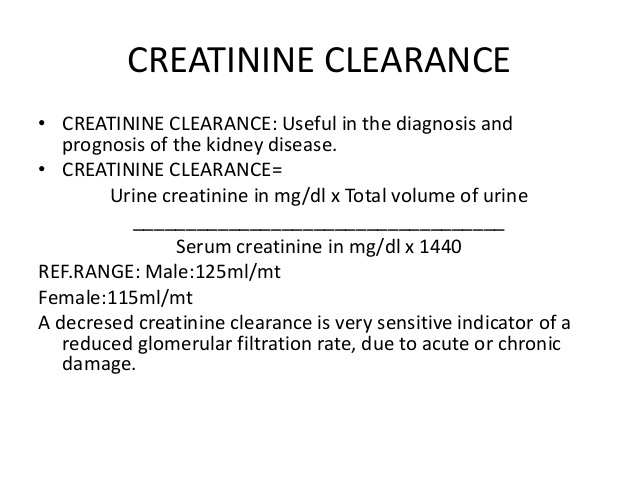 When GFR is 100 milliliters per minute (mL/min) it means you have 100% kidney function, while GFR of 30 mL/min means your kidney function is reduced to 30% of its ability of creatinine clearance. As the chronic kidney disease progresses the GFR decreases. When GFR is less than 15 mL/min it means you lost about 90 to 85 percent of kidney function and developed end stage kidney disease that need dialysis to take wastes of the body out. Normal GFR range means normal kidney function while low GFR level means that your kidney function is low. If you have mildly low GFR from 60 and less than 90 you’re not a kidney disease patient unless you see protein in urine test, then your kidney at the stage 1 CKD. However, low GFR must remain for three consecutive months for CKd to be diagnosed. There are usually no symptoms at stage 1 to indicate the kidney damage. Best approaches to prevent kidney disease progresses more is to stop or minimize the dosage of ibuprofen and other medications that cause kidney damage. If you have GFR results between 30 and 59, this means moderate stages of chronic kidney disease. What happens at Stage 3 CKD? complications of kidney disease such as high blood pressure, anemia, early bone disease as well as kidney pain felt in back, muscle cramps, and swelling (edema) of extremities due to fluid retention. What blood test results show when I have Stage 3 CKD? protein in urine, low hemoglobin, low calcium level, and low serum albumin in addition to S.creatinine over 3 mg/dl and BUN over 100 mg/dl. Recommendations: treatment plan by a nephrologist and keep the blood levels at satisfactory values. GFR below 30 means sever kidney disease while GFR of 15 or below means Kidney Failure. Lab results: SCR over 10 mg/dl, BUN over 150 mg/dl, Low Vitamin D, High PTH, Low Calcium, and abnormal cell casts in urine (with foamy stinky dark urine). What to do if GFR range is 15? Kidney failure reverse process include dialysis or kidney transplant when needed to survive. eGFR stands for Estimated Glomerular Filtration Rate. By using the level of creatinine, your age, race and gender and substitute in a special equation. There are two questions to calculate eGFR from a blood creatinine sample, the old C-G equation and the newer MDRD equation. First equation: The MDRD eGFR equation. MDRD equation is only for chronic kidney disease (CKD), acute renal failure will not come with accurate eGFR results. Estimations of creatinine clearance and GFR are not the same, that’s why? reabsorb important chemicals from the initial filtrate. GFR MDRD equation measures only the glomerular ability to filter creatinine as a waste. The medications that inhibit the active secretion of creatinine in the proximal tubule will falsly elevate serm creatinine but not the GFR. The medications that can cause false increase in serum creatinine isfor instance; trimethoprim, cefoxitin (an antibiotic sometimes used for perioperative prophylaxis. Creatinine clearance is a good marker for drug dosing instead of GFR. MDRD GFR equation is valid only for chronic kidney disease and not accurate for acute renal failure as the Cockcroft and Gault equation. Because MDRD set after studies on patients with renal dysfunction, it loses precision in patients with normal renal function whose GFR above 60 mL/min/1.73 m2. The Cockcroft and Gault equation estimates creatinine clearance and is not adjusted for body surface area. GFR estimates from the MDRD Study equation doesn’t rely on a patient’s size to estimate kidney function. Modify the estimate and range of the Cockcroft-Gault by calculate BMI to avoid the error results from the differences of patient’s body weight and BMI. Measuring GFR from creatinine clearance test for 24 hour urine Collection. Useful in patients who have large muscle mass or a marked decrease in muscle mass. How do doctors identify kidney problems? Measuring the level of serum creatinine in your blood: to estimate glomerular filtration rate (GFR), as GFR helps to identify which stage of the disease your kidneys are reached. Urine test for protein in urine: Proteinuria is a sign of mild kidney damage even if the GFR is about 90. Normal blood pressure level represents normal selective ion exchange by kidney system. Here some tips of what to do if you have abnormal GFR test results? Repeat Creatinine, GFR and Urine tests periodically even if the numbers are normal, especially if you from those at risk to develop kidney disease. Early detection and identification of kidney problems lead to early treatments and close prevention of worsening the disease. Have a family history of kidney disease. You’re over 60 years of age. You’re african american, Hispanic, asian or american indian. You can subscribe to get free explanation for your results and learn what’s the next step to to.